Friends of the Madison Public Library is a member-supported organization that advocates, raises funds and provides critical support for the Madison Public Library and related literary and educational programs. We provide the community with opportunities to invest in the success of the Library by donating funds or by donating time through volunteering. 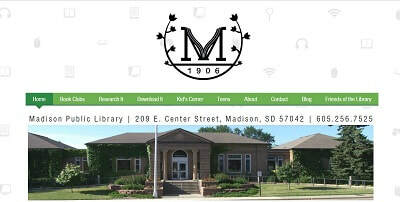 We plan to raise money and raise our voices to promote a first-class public library for Madison, South Dakota. We are a collection of committed, caring individuals who share a common vision of a superior free public library accessible by all. Would you like to one of the first volunteers? Our Volunteer Interest Sheet is online for your convenience. Questions? You can find information on programs and events on our Facebook page. Would you like to make a donation to the Friends? You can use this button to safely make a donation through Paypal using your credit card. Or you are welcome to drop a check at the library any time. Click here to fill out a Volunteer Interest Form. Snapshot website is everything about your business on one page.